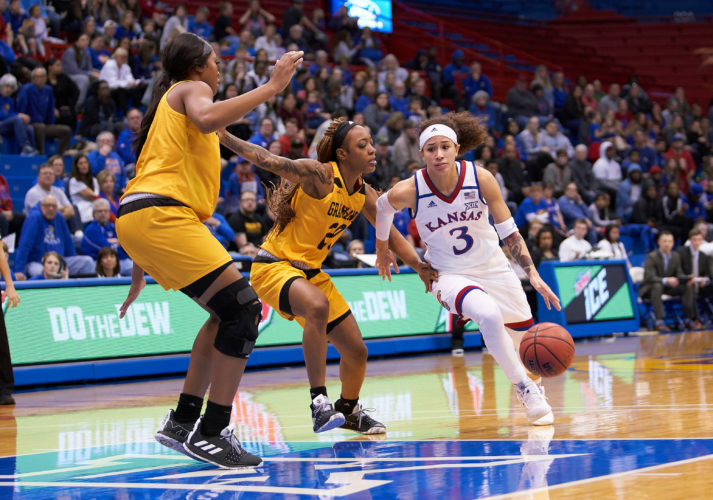 The Kansas women’s basketball team couldn’t stop Texas Tech’s Zuri Sanders during a 69-66 loss Wednesday night inside United Supermarkets Arena. The Jayhawks (10-3, 0-2 Big 12) were led by sixth-year guard Jessica Washington’s 22 points and three assists. Washington’s 22 points marks her third 20-point performance of the season and 15th of her career. Senior guard Kylee Kopatich added 13 points, with all but three coming in the third quarter. Texas Tech (10-4, 1-2) was led by Sanders, who posted a double-double with a career-best 21 points and grabbed 16 rebounds. Freshman guard Chrislyn Carr added 19 points and five assists. Kansas travels to Kansas State at noon Sunday.